t is ironic that despite the severe risks attached to the work he did for me it was a desk job at a well-known NGO that caused my friend to uproot his life again and flee. After a number of threatening letters and text messages from the Taliban, he has left his family and is living a miserable hand-to-mouth existence on the border with a neighbouring country. Staff and freelance contributors were told yesterday that Venue, Bristol and Bath’s what’s on magazine, is likely to close with the publication of issue 962 on March 16. 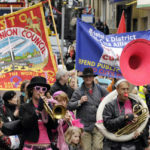 TOMORROW, Saturday 19th February, NUJ Bristol Branch will be joining a huge demonstration in the city to protest against the Tory-led government’s public sector spending cuts. The branch is calling on all local NUJ members to join in and march under the green and white National Union of Journalists banner.